Finding a certified FHA HUD 203(k) Consultant can be a hard thing to come by- why you ask? Finding a 203k Consultant to use in the FHA 203(k) renovation mortgage process is the responsibility of the homeowner or purchaser. This can be a daunting task, as many general contractors do not understand the process - how to start, what paperwork is involved and how to create the bid – working with a HUD/FHA Consultant, even understanding how they get paid. So then how is a customer, who is also new to the 203(k) process supposed to find a general contractor? 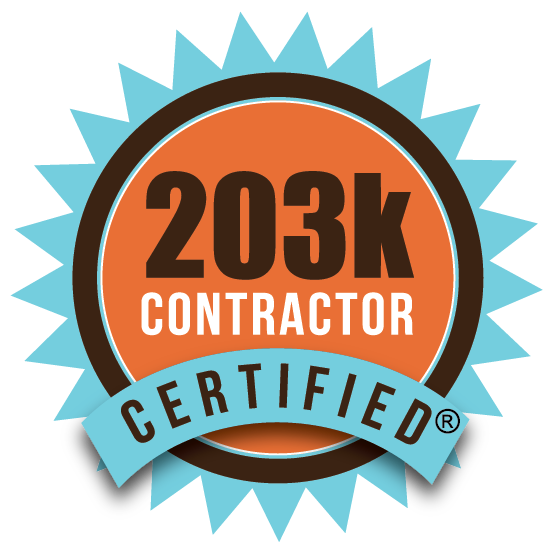 That's where Tribest Construction LLC comes in as licensed Certified HUD 203(k) Consultants! Tribest Construction, LLC are highly qualified 203k Consultants and have been certified HUD/FHA 203(k) Consultants for over 10 years. We welcome the opportunity to effectively and efficiently serve you – who are actively looking for a certified 203(k) HUD/FHA Consultant. We have a tremendous amount of experience and have assisted numerous homeowners in obtaining their dream home by assisting them through the HUD 203(k) Consultant process. We are highly qualified to assist you through the 203k consulting process – by having an expert on your team we are able to assist you to ensure your 203k process runs more smoothly. As your HUD 203k Consultant, we ensure we are there to help the process move more proficiently for everyone involved. Renovate your home with little or no additional out-of-pocket expense and low down payment. Combine purchase/refinance + rehab funds into one low-interest, tax-deductible mortgage based on improved appraised value. Include mortgage payments in the loan to cover rehab period. Submit a strong purchase offer if presented properly to seller. Experience less competition from other buyers who are not in the market for fixer-uppers and enjoy greater opportunities for “good deal” on home purchases. Choose from a broader selection of homes for sale in any condition, including condos, townhouses, mixed-used, multi-family, single family dwellings, and those that do not currently meet FHA standards. Tribest Construction LLC services the Maryland, Washington, DC Metropolitan area. We build strong turnkey projects and robust client relationships through quality, integrity, and teamwork. Our goal is to exceed our client’s expectations within their allocated budget. We are proud to be part of 203(k) experts serving the Maryland and Washington, DC area as HUD/FHA 203(k) Consultants and are delighted in making owning a home a reality for you and your family! Please consider our company for your HUD/FHA 203(k) consulting services. Please feel free to contact us if you are looking for experienced HUD/FHA 203(k) Consultant!